Sotheby’s has announced further details of the wines of Domaine de la Romanée-Conti that are being sold from the cellars of Robert Drouhin this autumn. Billed as the closest thing to an ex-cellar sale from the famed Burgundian estate there has ever been, the sale will take place on 13 October in New York and feature 100 lots spanning 1937-1964. The wines were all acquired by the Drouhin family during their time as the exclusive distributor of Domaine de la Romanée-Conti in France and Belgium. In addition to the DRC, the sale will also feature several bottles of Drouhin’s own grands crus wines from 1959, 1961 and 1962.
Notable highlights are listed below but include three magnums of 1937 Romanée-Conti as well as bottles from 1938, 1945, 1959 and 1964; bottles of La Tâche 1941, 1942, 1943 and 1945 and a magnum of 1959 and bottles of Richebourg 1947, 1959 and 1961. 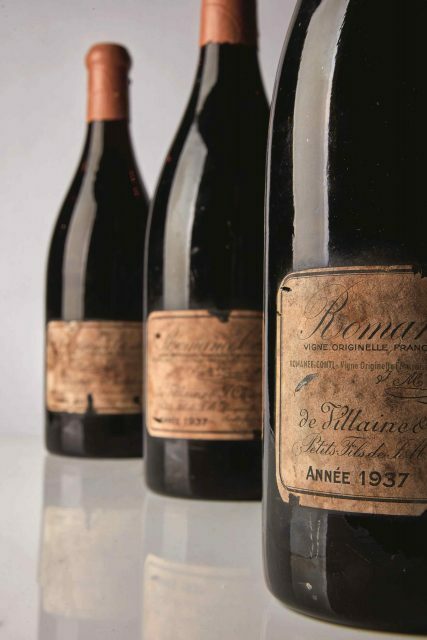 The magnums of Romanée-Conti has the auction’s highest pre-sale estimate of US$30,00-$40,000 apiece. Robert Drouhin said: “It is a great pleasure to offer these 100 lots at auction with Sotheby’s Wine in October. These wines span four decades and are filled with remarkable and historic vintages from one of the world’s greatest Domaines. I have had access to these remarkable wines for many years, given that Maison Drouhin was the exclusive importer of Domaine de la Romanée-Conti in France and Belgium from the late 1920’s to the early 1960’s. Serena Sutcliffe, MW, honorary chairman of Sotheby’s Wine, added: “It is a great privilege for us to offer this historic collection of wines from the Drouhin family’s legendary cellar. This is an enchanted kingdom in the realm of wine and we are honoured to be asked to bring these precious bottles to auction. The vintages are among the greatest ever made in Burgundy, both extremely rare and gloriously individual. “The perfect provenance stems from the long relationship between the Domaine de la Romanée Conti and the Drouhin family, two of the most respected names in Burgundy. The breathtaking line-up of DRC’s stunning vineyard sites brings back memories of vocabulary-defying wines that are imbued with the excitement and complexity of tasting at its pinnacle. One can hardly believe that these wines still exist – but, happily, they do!